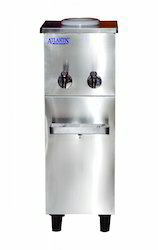 Offering you a complete choice of products which include atlantis bottled water cooler. Cold Temperature Range 7~130 Deg. Cel. Our company has gained name and fame in presenting Atlantis Bottled Water Cooler. This product is optimal in working and offered with a double tap. Safe from more load of the water filled bottle, this product is quality checked by professionals. The damage-proof body gives strength to this cooler. Additionally, this product is offered in the market in perfect form. Our company has gained name and fame in presenting Atlantis Bottled Water Cooler . This product is optimal in working and offered with a double tap. Safe from more load of the water filled bottle, this product is quality checked by professionals. The damage-proof body gives strength to this cooler. Additionally, this product is offered in the market in perfect form.